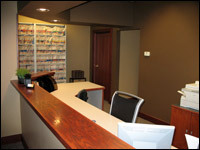 Comfort and convenience are the hallmarks of the Center for Restorative and Laser Dentistry's office operations. To ensure your convenience, below is the information you need about our hours, location, appointment scheduling, insurance acceptance and billing. 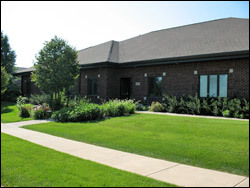 The Center for Restorative and Laser Dentistry is a state of the art dental facility, designed to make your dental appointment as comfortable as possible. The incorporation of lasers into our practice has revolutionized the way we treat patients. Many procedures, from fillings to gum surgery, can be accomplished quickly, comfortably and conservatively with the use of lasers, often without the need for anesthesia. Improvements in dental materials have allowed us to improve the appearance of your smile, such as tooth colored fillings, laser whitening and invisible braces. If your smile could use a little enhancement or a full makeover, we have extensive training and experience with the latest cosmetic dental procedures using veneers (with minimal and sometimes no tooth preparation) and beautiful all ceramic crowns and bridges. While we have many advanced techniques and materials to restore your teeth to proper function and esthetics, our number one commitment is the prevention of dental disease, helping you and your family to achieve and maintain a state of optimal oral health. If this is your first visit, please arrive at our office 15 minutes prior to your scheduled appointment time. This will allow us to confirm that we have the necessary forms (registration, medical history and insurance/billing information) completed prior to your appointment. We respect your appointed time and make every effort to stay on schedule ourselves. Since we are rarely late, please understand if we are delayed because of a dental emergency. Please respect the time that we have reserved for you in our schedule by being on time for your appointment. A delay in beginning your appointment will cause following patients to wait unnecessarily for their appointment times. Late arrivals of 15 minutes or more will be re-appointed to another day. As a courtesy, our office will attempt to contact you for confirmation one day prior to your appointment. However, we do ask that patients and/or parents assume responsibility for their appointment time. Treatment is delayed, which in some cases can further complicate dental conditions. The Doctor and staff must wait for the next scheduled patient to arrive before they can resume work. Another patient who needed treatment could not be seen, because we did not have enough time to make other appointment arrangements. In the rare instance that you should need to cancel or reschedule your appointment, we require at least 48 hours notice for schedule changes to avoid a missed appointment charge. Repeated short term cancellations and broken appointments will result in no re-appointment. Our number one concern is our patients’ dental health. Providing services in a timely manner is critical to accomplishing that goal. We appreciate your understanding and consideration regarding our appointment policies and hope this information will be helpful to you as you schedule future dental appointments. If you would like to schedule an appointment, please contact us or request an appointment via our website. We work with almost all traditional insurance plans (a plan that allows you to choose your own dentist) and we are preferred provider with Delta Dental. If you are covered under a dental insurance plan, we ask that you present your insurance card and/or policy information at the time of your appointment. If we have received all of the required information, we will electronically file your dental insurance claims at no charge and will make every effort to assure you receive the maximum benefits to which you are entitled. We believe that important decisions regarding your dental care should be made by you and your dentist, not your insurance company. Once you have decided on a course of treatment, we will do our best to make as close a calculation as possible of what your insurance will pay, allowing you to know in advance what estimated patient portion will be expected at the time of your appointment. Most plans cover only a portion of dental fees, which means you will be responsible for your deductible and estimated co-payment at the time that services are provided. When feasible, we will file a pre-treatment estimate with your insurance company which will give a more accurate estimate of your expected benefits. Please do not hesitate to ask questions regarding our financial and insurance policies. We want you to be comfortable in dealing with these matters and we will be glad to assist you. No one likes to be surprised when it comes to financial matters. This is why we have taken the extra step of listing our financial policies below for our current and prospective patients. We are aware that dental care may involve an investment in both your time and money. We encourage discussion of fees prior to procedures being performed. Your treatment plan will include a breakdown of all fees and we will inform you of all costs before treatment is administered. Payment is expected on the day that services are provided. For your convenience, we accept Visa, Mastercard, Discover, American Express, personal checks and cash. For payment in full at the time of service, we offer a 5% fee reduction for personal check and cash payments and a 3% fee reduction for credit card payments. Our goal is to provide our patients with a variety of financial arrangements that allow them to receive and pay for quality care in a manner that best suits their personal situation. For extensive treatment plans, we offer 3, 6 and 12 month, no interest financing through CitiHealth Card (www.healthcard.citicards.com) or low interest financing through Capital One Healthcare Finance (www.capitalonehealthcarefinance.com). If you have questions regarding patient financing, please contact us and we will be happy to review our payment options with you in order to accommodate your financial needs.